Townes Van Zandt, that very blue Texas singer-songwriter, used to say: "There are only two kinds of songs: There's the blues, and then there's zippity-do-dah." Well, the blues will come later (watch this space). 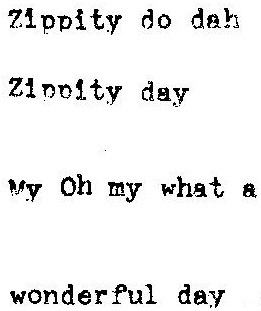 In the meantime, here's the Zippity-Do-Dah typewriter! Stripped naked! And maybe not quite in the "Z" range of top-quality typewriters. 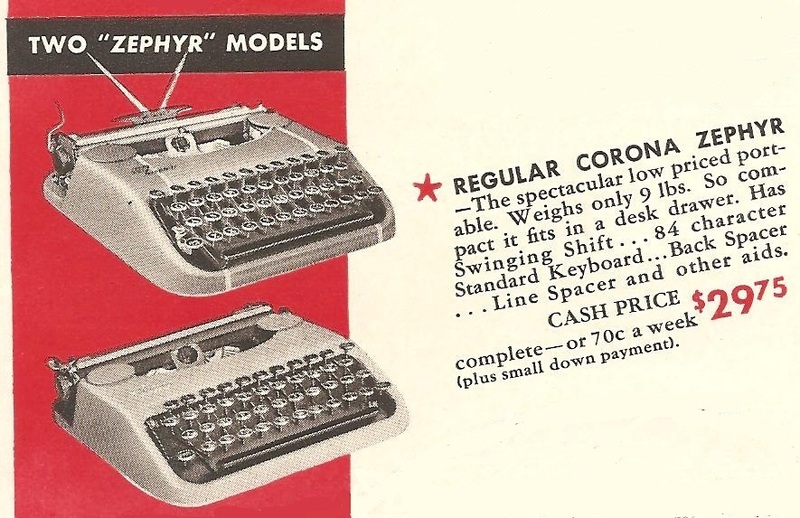 When, in 1938, Smith-Corona introduced this very basic Zephyr portable, as the American answer to the Swiss Hermes Featherweight-Baby, it did so at the cut price rate of $29.75. That apparently translates to $465.75 today, just $40.75 less than the price Charles Gu at myTypewriter.com charges for one of these. But bear in mind that in 1940, the average wage was $1725, the average cost of a new house $4000, a new car $850 and petrol was 11c a gallon. So $29.75 was about the price of a new suit. This model was called the "Regular Corona Zephyr" - in other words, absolutely no frills whatsoever. The Deluxe version cost $10 more. But at the top of this range of five Smith-Corona portables introduced at this time was the Silent at $64.50, followed by the Sterling at $59.50 and the Standard at $49.50. Here are some "Before" images. Note the almost obligatory dead cockroach found under the carriage (circled in red): Deep-seated rust and layers of heavy muck aside, this fossil was a sure sign of the serious neglect this typewriter had suffered over 70 years. POSTSCRIPT: I thank Richard Polt for his prompt and positive comments. I did seriously contemplate repainting this Zephyr, even in a drab colour. But while the back section was easy to take apart (see photo with cockroach), I found it impossible to remove the workings and keyboard from the main outer casing, so a paint job was out of the question. I agree with Richard that this was turned out to be the best option. I don't know how Corona got the workings and keyboard in there; maybe the base was welded on later. Some early Royals have a welded front section, making them impossible to take apart completely. In terms of the modernish, stylish design and body shape, remember that after the War, Corona returned this same model to the market as the Skyriter. Fabulous!! You are getting some really intriguing effects with decals on bare metal. I always thought the Zephyr had a good-looking, streamlined body, but the paint is so drab, particularly after all these years. This is the perfect treatment. Great job. Best part is you had a decal to put back on the machine. Is that printed onto transparent self adhesive film? What's amazing (to me, at least) is that the body shape must have been pretty modern-looking in '38, yet Corona persisted with the old fashioned familiar and instantly recognisable key-tops. Looks great! Hi Rob. Thanks. The decals are printed on decal paper made in the US by Testors. I get it from hobby shops here, six A5 sheets in one package (it's expensive). It's mostly used by people making model aircraft etc. I have tried the transparent self-adhesive stuff; much, much easier to work with, but not quite the same thing. It tends to "sit above" the surface more than the transfers; in other words, it looks a little more obvious. But as I said before, the real expert in the area of typewriter decal transfers is, in my opinion, Paul Robert in Amsterdam. At one time he sold decals, not sure if he still does it. This comment comes a bit late, but getting a Zephyr out of the body can be done, you just need to compress the first row of keys and then slide it out. It's stupid, but it works. I had to fiddle with the thing for 40 minutes before if finally came out. When you reassemble it, it just slides in with a sort of compressed click. The newer body style was a great improvement in ease of disassembly. That is the coolest typewriter I have ever seen. I have to have one! And the logo is a masterpiece! My compliments to you on a marvelous, artistic achievement. Fascinating account. I have a Skywriter, but I've yet to see one of these in the thrift shops and junque stores that most of my collection came from. But that paint was there for a reason - won't the bare metal, which looks like mild steel, rust rapidly? Ned, thanks for your interest. None of the machines I've stripped down to the bare metal have ever shown the slightest sign of corrosion as a result, not even after some years of being "naked". Kudos on your "Zippety Doo Dah" Corona Zephyr. I want to make one like it and know how to get the works in and out of the shell but am intimidated by the (mysterious) process of making a logo. If you have an extra, or would do it for me, I'd be happy to pay whatever is reasonable. I follow your blog and collect/use compact portables including Hermes Baby, Olympia SF Deluxe, Brother Activator, Adler Tippa, Olivetti Lettera 22, and Corona Skyriter. I've disassembled and reassembled a couple Zephyrs now, and you're quite right, it initially appears impossible! My best technique involves using a stack of several sheets of letter size paper to "shoehorn" the keyboard in and out of the enclosure. Once I figured it out, I was able to do it in five minutes. I currently have a quite good looking Zephyr Deluxe in the mail, and will try to get a few snapshots of the process as I do it. I'm regularly on the Typewriter Collectors' Facebook page, so will likely post there. While I'm here: I've been looking for a carriage return spring for my first Zephyr for over a year without success. If anyone out there has one I'd love to hear from you. This is my first time commenting on this blog, but I've read things here hundreds of times. Thanks for a stunning wealth of information! I had a similar experience, but used a sheet of tough, flexible plastic. If you want a Zephyr parts machine I have one for $10 plus shipping. Caveat: I don't know whether it has a good carriage return spring. Bob Stites (bobwsti@gmail.com).